When some co-workers and I decided to try our hand at a lunch-time role-playing campaign, I knew that game prep was going to be critical to making it work. But not the sort of game prep I normally did; this was all about the physical game prep. We’re playing The Day After Ragnarok using the Savage Worlds rules, and thanks to Ken Hite’s numerous adventure generation tables, the scenarios practically write themselves. No, the part the essential part of making this campaign work was making sure I knew where my towel was. Dice. Initiative cards. A battle map. Miniatures. I have all of this stuff in my game room … but we’re not playing there. We’re in an under-ventilated, odd-smelling basement conference room whose only virtues are privacy, a table, and a dry erase board. All of the dice, minis, chips and tokens went into ziplock bags, which in turn were packed into the lunchbox. So did the rest of the supplies, making it a dense little package, but one that has almost everything I need to run the game. The other essentials — my Savage Worlds Explorer’s Edition rule book, The Day After Ragnarok campaign guide and a small RPGA battle map — go into my messenger bag. My game notes are either on the spiral-bound notebook or my laptop; both go in the messenger bag. I can setup and breakdown the gaming kit in about five minutes, which is essential when you’ve only got 60 to play with. It’s worked out well — since I leave the kit at work, I never scramble for supplies and always arrive with everything I need. Hell, the hardest part of the game is actually remembering to bring my lunch. 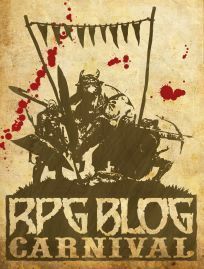 This article is part of the “Preparation – Everything or Nothing?” RPG Blog Carnival topic being hosted by Fame & Fortune. #RPGaDay 2018 – Wildest character name?